CB2 Cannabinoid Receptors as a Therapeutic Target—What Does the Future Hold? The past decades have seen an exponential rise in our understanding of the endocannabinoid system, comprising CB1 and CB2 cannabinoid receptors, endogenous cannabinoids (endocannabinoids), and the enzymes that synthesize and degrade endocannabinoids. The primary focus of this review is the CB2 receptor. CB2 receptors have been the subject of considerable attention, primarily due to their promising therapeutic potential for treating various pathologies while avoiding the adverse psychotropic effects that can accompany CB1 receptor–based therapies. With the appreciation that CB2-selective ligands show marked functional selectivity, there is a renewed opportunity to explore this promising area of research from both a mechanistic as well as a therapeutic perspective. In this review, we summarize our present knowledge of CB2 receptor signaling, localization, and regulation. We discuss the availability of genetic tools (and their limitations) to study CB2 receptors and also provide an update on preclinical data on CB2 agonists in pain models. Finally, we suggest possible reasons for the failure of CB2 ligands in clinical pain trials and offer possible ways to move the field forward in a way that can help reconcile the inconsistencies between preclinical and clinical data. The endocannabinoid system consists of endogenous cannabinoids (endocannabinoids), cannabinoid receptors (primarily CB1 and CB2), and the enzymes that synthesize and degrade endocannabinoids. A complete [receptor(s), enzymes, and endocannabinoids] endocannabinoid system appears to be present in all vertebrates (Elphick and Egertová, 2005). Δ9-Tetrahydrocannabinol (Δ9-THC), the primary psychoactive component of cannabis, produces many of its psychoactive effects by engaging CB1 cannabinoid receptors. In addition to its psychoactivity, cannabis has been shown (or suggested) to be efficacious for multiple therapeutic indications and maladies (Grotenhermen and Müller-Vahl, 2012; Borgelt et al., 2013). Most of these appear to be mediated by Δ9-THC’s activation of either CB1 or CB2 receptors, though cannabidiol can be an important factor in the therapeutic efficacy of Cannabis-based medicines (Campos et al., 2012). These potential therapeutic effects of Δ9-THC have motivated a great deal of drug development over the past 40 years. Most of these efforts have taken the form of targeted manipulation of endocannabinoid engagement with cannabinoid receptors or inhibition of the enzymes that degrade endocannabinoids. A major limitation for the therapeutic development of compounds that directly activate CB1 receptors is unwanted psychotropic effects (Volkow et al., 2014). These CB1-mediated psychotropic actions produce both practical and administrative hurdles that have severely curtailed the development of direct-acting CB1 agonists. In contrast, activation of CB2 receptors does not appear to produce these psychotropic effects (Deng et al., 2014). Thus, the observation that CB2 receptor activation produces desirable actions in a range of preclinical models (Leleu-Chavain et al., 2012; Han et al., 2013) attracted considerable interest and generated much activity in both academic and commercial laboratories. For example, agonists targeting CB2 receptors have been proposed as therapies for the treatment or management of a range of painful conditions, including acute pain, chronic inflammatory pain, and neuropathic pain (Ehrhart et al., 2005). They may also be helpful in treating diseases that have a neuroinflammatory or neurodegenerative component, such as multiple sclerosis (Pertwee, 2007; Dittel, 2008), amyotrophic lateral sclerosis (Kim et al., 2006; Shoemaker et al., 2007), Huntington’s disease (Sagredo et al., 2012), and stroke (Zhang et al., 2007; Pacher and Hasko, 2008). CB2 agonists have also been proposed as therapeutics in peripheral disorders that involve inflammation, including atherosclerosis (Mach et al., 2008), inflammatory bowel diseases (Izzo and Camilleri, 2008; Wright et al., 2008), ischemia/reperfusion injury (Bátkai et al., 2007), renal fibrosis (Barutta et al., 2011), and liver cirrhosis (Mallat et al., 2007; Izzo and Camilleri, 2008; Lotersztajn et al., 2008). Both epidemiologic and preclinical data suggest that activation of CB2 receptors may be protective in osteoporosis (Ofek et al., 2006). Finally, CB2 agonists have shown efficacy in preclinical cancer models (Guzman, 2003; Izzo and Camilleri, 2008; Wright et al., 2008). However, despite very favorable efficacy in a range of preclinical models, CB2 agonists have fared poorly in the clinic. In this review, we summarize our current state of knowledge of CB2 receptor signaling, review preclinical and clinical studies using CB2 agonists, discuss the mismatch between preclinical and clinical results, and suggest possible ways forward. As mentioned above, CB2 agonists may be beneficial for a variety of ailments. However, this minireview focuses primarily on CB2 agonists for treating chronic pain. Nonetheless, many of the concepts discussed apply to the use of CB2 agonists for other therapeutic indications. Like CB1 receptors, CB2 receptors are class A serpentine receptors that couple primarily to Gi/o proteins to modulate an array of signaling pathways: adenylyl cyclase, mitogen-activated protein kinase [MAPK (p44/42 and p38)], c-Jun N-terminal kinase, Akt kinase/protein kinase B, phosphoinositide 3-kinase/Akt nuclear factor κ-light-chain-enhancer of activated B cells, nuclear factor of activated T cells, cAMP response element–binding protein/activating transcription factor, Janus kinase/signal transducer and activator of transcription, sphingomyelinase, and caspase, as well as some potassium and calcium ion channels (Bouaboula et al., 1996; Pertwee, 1997; McAllister et al., 1999; Sugiura et al., 2000; Howlett et al., 2002; Molina-Holgado et al., 2002; Ehrhart et al., 2005; Herrera et al., 2005, 2006; Pertwee et al., 2010; Atwood et al., 2012a) (Fig. 1). 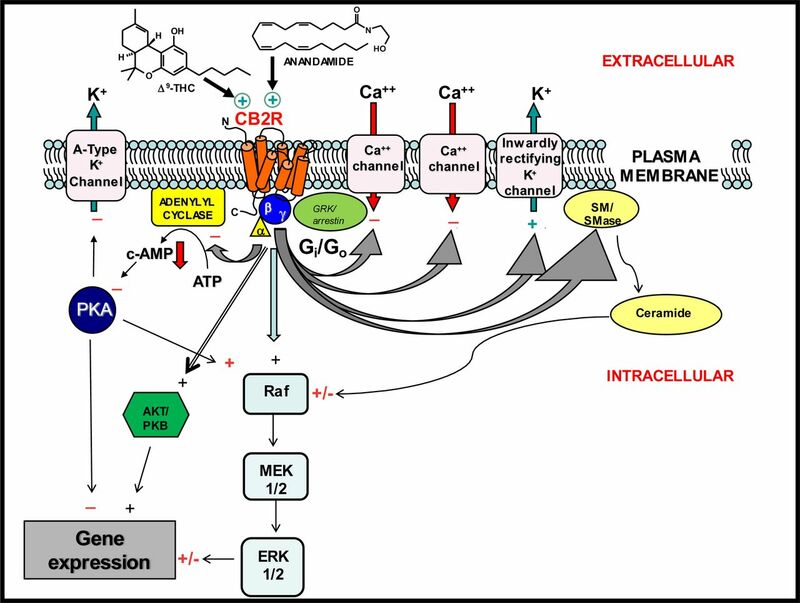 Despite activation of a wide range of signaling pathways by CB2 receptors, characterization of CB2 receptor ligands has primarily focused on modulation of adenylyl cyclase and extracellular signal–regulated kinases 1/2 (ERK1/2), while other pathways, such as those involving arrestin, Akt, ceramide, and ion channel modulation, and the physiologic processes they mediate, are much less well studied. Activation of CB2 receptors by natural or synthetic ligands favors a range of receptor conformations that can variably affect different signaling pathways in the following ways: 1) inhibition of adenylyl cyclase, decreased cAMP production, and less activation of cAMP-dependent protein kinase (PKA), culminating in inhibition of A-type potassium channels and inhibition of some gene expression; 2) activation of Akt/protein kinase B, stimulating cell survival, migration, and growth; 3) activation of the MAPK cascade, favoring cell survival and modulating gene expression; 4) inhibition of specific calcium channels and enhanced opening of G protein–gated inwardly rectifying potassium (GIRK) channels; 5) stimulation of de novo synthesis of ceramide and inhibition of the MAPK cascade, promoting apoptosis; 6) recruitment of β-arrestin to the activated CB2 receptor, resulting in desensitization and/or internalization of the receptor and potential activation of arrestin-specific signaling; and 7) decreased PKA activity, which increases Raf-1 to stimulate the MAPK cascade, positively regulating the expression of many genes. + indicates activation of pathway by CB2 receptor agonists; – indicates inhibition/downregulation of pathway by CB2 receptor agonists; +/− indicates a variable outcome. CB2 receptor–mediated pertussis toxin–sensitive Gi/o protein stimulation leads to inhibition of adenylyl cyclase and decreased cAMP levels (Felder et al., 1995; Slipetz et al., 1995; Mukherjee et al., 2004). However, expression levels and the environment of expression influences strongly influence the coupling of CB2 to adenylyl cyclase inhibition. For example, stimulation of CB2 receptors on human lymphocytes that endogenously express CB2 receptors poorly inhibits forskolin-stimulated adenylyl cyclase compared with CB2-transfected human embryonic kidney or Chinese hamster ovary (CHO) cells (Bouaboula et al., 1996; Pertwee, 1997, 1999; Schatz et al., 1997; Herring et al., 1998; Gardner et al., 2002; Massi et al., 2003). Similarly, activation of CB2 receptors in mouse spleen cells that endogenously express CB2 receptors does not inhibit forskolin-stimulated adenylyl cyclase at physiologically relevant agonist concentrations (Kaminski, 1993; Kaminski et al., 1994). However, activation of CB2 receptors in the BV2 microglial cell line inhibits adenylyl cyclase (Franklin et al., 2003). A particularly interesting example is the natural product 4′-O-methylhonokiol, which shows inverse agonism for cAMP production and agonism for release of intracellular calcium (Schuehly et al., 2011). MAPKs are enzymes involved in a wide variety of vital signaling cascades in many cellular responses, including cell proliferation, migration, transformation, and cell death. Bouaboula et al. (1996) were the first to report the time- and dose-dependent activation of ERK1/2 by CB2 agonists in CHO cells transfected with CB2 receptors. They found this activation to be pertussis toxin–sensitive, indicating involvement of Gi/o protein, but adenylyl cyclase–independent. They further showed that activation of this signaling cascade results in phosphorylation of transcription factor Krox-24, thus indicating potential control of gene transcription by CB2 receptors. Unlike inhibition of adenylyl cyclase, ERK1/2 activation is routinely observed in both recombinant as well as nonrecombinant cells/systems (Beltramo, 2009). For example, robust ERK1/2 activation was also reported in immune cells as well as microglia and macrophages, thus confirming the likely physiologic relevance of this pathway (Beltramo, 2009; Merighi et al., 2012). p38 MAPK activation by a nonselective CB2 receptor agonist (Δ9-THC) was found to have a proapoptotic effect in the Jurkat human leukemia cell line (Herrera et al., 2005) and cytotoxicity in J774-1 macrophages (Yamaori et al., 2013). This effect was exclusively mediated by CB2 receptors (Herrera et al., 2005; Yamaori et al., 2013; Kauppinen et al., 2014). Interestingly, Yamaori et al. (2013), in the same cells, also found a c-Jun N-terminal kinase–mediated cytoprotective effect mediated by Δ9-THC activation of CB2 receptors. Thus, the same CB2 receptor ligand can activate different MAPKs with varied responses and outcomes (Lopez-Ilasaca, 1998). Although initial experiments failed to detect functional coupling of CB2 receptors to G protein–gated inwardly rectifying potassium channels and calcium channels (Felder et al., 1995; Pertwee, 1997), other reports suggest that CB2 receptors can modulate the activity of these channels (Ho et al., 1999; McAllister et al., 1999; Atwood et al., 2012b). Atwood et al. (2012b) showed CB2 receptor-mediated inhibition of voltage-gated calcium channels in AtT20 cells. CP55940 [(−)-cis-3-[2-hydroxy-4-(1,1-dimethylheptyl)phenyl]-trans-4-(3-hydroxypropyl)cyclohexanol effectively inhibited voltage-gated calcium channels, while WIN55212-2 [(R)-(+)-[2,3-dihydro-5-methyl-3-(4-morpholinylmethyl)pyrrolo[1,2,3-de]-1,4-benzoxin-6-yl]-1-naphthalenylmethanone mesylate] was inactive on its own and antagonized CP55940 inhibition. Thus, the reason some of the earlier studies failed to find ion channel modulation can likely be attributed to the functional selectivity of the ligands used in the earliest studies (see below) (Atwood et al., 2012b). Most G protein–coupled receptors (GPCRs) undergo some degree of internalization following agonist binding. Internalization can play a role in downregulation of the GPCR’s ability to signal at the membrane (Ferguson, 2001). Additionally, internalized GPCRs can engage novel signaling pathways inaccessible to GPCRs residing on the surface membrane (Miller and Lefkowitz, 2001). Thus, internalization of a GPCR in response to a ligand can be considered a form of signaling. CB2 receptors exhibit variable internalization in response to an agonist, with some agonists promoting marked internalization and others being inactive (Grimsey et al., 2011; Atwood et al., 2012b; Petrov et al., 2013). β-Arrestins are multifunctional proteins that downregulate G protein signaling through direct interactions with GPCRs (Ferguson et al., 1996), as well as serving as scaffolds to recruit other signaling complexes to GPCRs (Miller and Lefkowitz, 2001). β-Arrestin activation is conventionally measured by enzyme complementation, bioluminescence resonance energy transfer, or optical imaging of the recruitment of fluorescently labeled arrestin molecules to the plasma membrane. Two studies have systematically evaluated arrestin recruitment by CB2 receptors and found that the limited number of CB2 ligands tested recruited arrestin to the plasma membrane (McGuinness et al., 2009; Atwood et al., 2012b). Although class A GPCRs can signal as monomers (Milligan, 2013), much GPCR signaling appears to involve homo- or heterodimerization of GPCRs (Milligan, 2013). Heterodimerization can greatly enrich the range of intracellular responses elicited by a ligand (Rozenfeld et al., 2012) and alter the pharmacology of receptor ligands (Rozenfeld and Devi, 2007). The capacity of CB2 receptors to dimerize and the potential implications of CB2 heterodimerization have not been deeply explored (Callén et al., 2012), but are likely to contribute to the heterogeneity of CB2 receptor signaling reported in various preparations. A particularly fascinating possibility is that dimerization of CB1 and CB2 receptors might produce novel receptor pharmacology as well as introduce a confound in interpreting the results of experiments using CB1/CB2 antagonists or deletion of one of the CB1 or CB2 receptor genes. Functional selectivity is the phenomenon in which different agonists activate distinct (or overlapping) intracellular signaling pathways (Kenakin, 2011) and is a concept that has important implications for drug development (Kenakin and Miller, 2010; Violin et al., 2014). Functional selectivity, also known as biased agonism or stimulus trafficking, is often noted as different agonists activating signaling pathways with different rank order potencies (Kenakin et al., 2012). A balanced agonist activates all pathways similarly, whereas a biased agonist shows bias toward a subset of pathways. In the most extreme example of functional selectivity, an agonist may maximally activate some signaling pathways and not others. Theoretically, functional selectivity offers the opportunity to “fine-tune” receptor stimulation. Functional selectivity could facilitate the discovery of agonists that stimulate signaling pathways to elicit desirable therapeutic benefits while avoiding activation of signaling pathways that may lead to undesirable side effects. However, if endogenous ligands are present at significant levels and are balanced agonists, which appears to be the case for endocannabinoids (particularly for 2-arachidonoylglycerol), functionally selective ligands may actually antagonize some signaling pathways activated by endocannabinoids, which could be detrimental. Interestingly, CB2 ligands show significant functional selectivity. For example, Shoemaker et al. (2005) found that endocannabinoids activated distinct signaling pathways with varied rank order potencies in CHO cells transfected with CB2 receptors. The endocannabinoid 2-arachidonoylglycerol was most potent in activating the ERK1/2-MAPK pathway, but higher concentrations were needed to inhibit adenylyl cyclase and induce calcium transients. On the other hand, noladin ether displayed higher potency in inhibiting adenylyl cyclase as compared with activating ERK1/2 and calcium transients. An even more extreme example of functional selectivity occurs for several commonly used CB2 agonists. Certain CB2 agonists (e.g., the aminoalkylindoles) inhibit adenylyl cyclase and activate ERK1/2, but fail to induce CB2 internalization or inhibition of voltage-sensitive calcium channels (Atwood et al., 2012b). This striking functional selectivity of CB2 receptor agonists must be considered during the therapeutic development of CB2 agonists and enriches the possibilities for developing drugs targeting CB2 receptors (Atwood et al., 2012b; Han et al., 2013). Arrestin-biased signaling has been found to produce useful therapeutic effects for other GPCRs (Wisler et al., 2007). To date, no strongly β-arrestin–biased CB2 agonists have been described, so it will be interesting to screen the rich repertoire of CB2 ligands synthesized to determine if arrestin-biased signaling exists for CB2 ligands and if arrestin-biased signaling is necessary or dispensable for CB2 actions in preclinical models (e.g., analgesia and anti-inflammatory). An interesting biologic property of CB2 receptors is their high inducibility, with CB2 mRNA levels often increasing as much as 100-fold following nerve injury or during inflammation (Maresz et al., 2005; Hsieh et al., 2011). If these increases in mRNA are followed by a corresponding increase in functional receptor protein, and activation of the receptor is therapeutically beneficial, then theoretically this leads to a therapeutically desirable situation in which agonists will stimulate CB2 receptors primarily where their activation will be beneficial. In healthy organisms, CB2 receptors are most abundant in cells of macrophage lineage, though they are also found in other immune cells (Galiègue et al., 1995). The extent of their expression in healthy central nervous system tissue is quite controversial. This topic has been recently reviewed. Caveats of the existing literature and suggestions for resolving the controversy can be found there (Atwood and Mackie, 2010). The bottom line is that immunocytochemical studies purporting to show CB2 expression are many, but are often flawed, and the inclusion of concurrent and careful controls is mandatory before accepting any claim of CB2 expression in a particular tissue. These conditions have been met for many immune cells, and possibly in neurons following pathologic insult, but remain to be established for most other tissues. In this regard, carefully conducted pharmacology has much to offer in discussions on CB2 receptor localization as the key question is often whether CB2 receptors are functionally involved in a response. The anatomic demonstration of CB2 receptors in this style of experiment is a secondary concern. A full consideration of the range of CB2 receptor ligands that have been synthesized and characterized is beyond the scope of this minireview. Several recent reviews have comprehensively considered this topic (Han et al., 2013, 2014) and can be consulted by the interested reader. An interesting development in the identification of naturally occurring ligands for CB2 is the existence of a number of abundant phytochemicals that engage CB2 receptors. Perhaps the best example of this is β-caryophyllene (Gertsch et al., 2008), which offers a starting point for novel compounds that influence endocannabinoid signaling (Chicca et al., 2014). A key concept to keep in mind when evaluating experiments conducted with CB2 ligands is that many of the commonly used CB2 ligands are only relatively selective with regard to CB1. This is because most of the commonly encountered CB2 ligands were evolved from molecules that have appreciable affinity for CB1 receptors. Therefore, the concentrations of CB2-preferring agonists that are commonly encountered in the literature (low micromolar) can result in significant occupancy of CB1 receptors, with subsequent signaling (Murataeva et al., 2012). Similarly, CB2-preferring antagonists at micromolar concentrations can substantially antagonize CB1-mediated responses (Murataeva et al., 2012). Thus, when interpreting the results of experiments conducted solely using a pharmacological approach, careful attention needs to be paid to the controls and a healthy skepticism maintained. Because of the typically low specificity of cannabinoid ligand pharmacology, the complementary use of mice lacking CB2 receptors is desirable to implicate CB2 receptors in a specific response. There are two CB2 receptor knockout lines in wide use. The first line was developed by Nancy Buckley and Andreas Zimmer (Buckley et al., 2000). This mouse was made by replacing the sequence coding for the receptor from the middle of its third intracellular loop through its stop codon, corresponding to amino acids 217–347, with a phosphoglycerate kinase–neomycin resistance cassette. Although this receptor is nonfunctional when tested for classical CB2 activity (Buckley et al., 2000), these mice make mRNA for the proximal part of the receptor (Liu et al., 2009), so there is the concern that this mRNA might be translated. This translated mRNA for the partial receptor could interact with other GPCRs to form partial dimers. Interestingly, if the protein corresponding to the truncated CB2 receptor is heterologously expressed in HEK293 cells, it is trafficked to a sub–plasma membrane compartment (B. Atwood and K. Mackie, unpublished data). In addition, background strain can strongly affect the immune phenotype of this mouse, necessitating caution in using this line to determine the utility of therapeutic manipulations of the endocannabinoid system in immune disorders, and presumably chronic pain, which often has a substantial immune component (Sisay et al., 2013). A second CB2 knockout line in common use is one that was made by Deltagen (San Mateo, CA) and is available from the Jackson Laboratory (Bar Harbor, ME) through the Knockout Mouse Project Repository (Davis, CA) (Wotherspoon et al., 2005). This mouse was constructed by deleting the sequence corresponding to amino acids 26–140, which comprises a portion of the amino terminus and the first three transmembrane domains (Yao and Mackie, 2009). Although the deletion is more proximal in this mouse, the presence of mRNA for the residual receptor still remains to be carefully examined. Thus, interpretation of experiments using either line of CB2 receptor knockout mice must be interpreted with the caveats that variable portions of the CB2 receptor may be present. Recently, the generation and characterization of a CB2 conditional knockout was reported. In this mouse an internal ribosomal entry site follow by the gene for green fluorescent protein was inserted downstream of the CB2 coding sequence, which facilitates localization of CB2 expression (Vazquez et al., 2014). An additional genetic resource that would be very helpful for the field is a knockin mouse expressing human CB2 in the mouse CB2 locus. The initial studies by Ibrahim and colleagues (Malan et al., 2001; Ibrahim et al., 2003) showing that the CB2 agonist AM1241 [2-​iodo-​5-​nitrophenyl-​(1-​(1-​methylpiperidin-​2-​ylmethyl)-​1H-​indol-​3-​yl)methanone] reversed tactile and thermal hyperalgesia in neuropathic rats and mice, independent of CB1 receptors (that is, the effect persisted in CB1 knockouts), stimulated a great deal of excitement. These findings offered the possibility of producing significant analgesia through the endogenous cannabinoid system in the absence of CB1-mediated psychoactivity. Subsequent work by a number of groups has confirmed and extended these studies with a variety of structurally distinct CB2 agonists (Murineddu et al., 2013). Generally, the field has moved away from AM1241, as AM1241 appears to engage a unique endogenous opioid–mediated component for its analgesia (Ibrahim et al., 2005; Whiteside et al., 2005); its enantiomers have different actions and its efficacy is species-dependent (Bingham et al., 2007); and it is a low-efficacy agonist, as it exhibits protean agonism (Yao et al., 2006). Significant issues in developing GPCR agonists for therapy include the potential for tolerance (i.e., the need for more drug to achieve the desired effect) or physical dependence (i.e., physical signs and symptoms upon cessation of drug administration) (Williams et al., 2013). When given in preclinical neuropathic pain models, tolerance develops quickly to efficacious doses of CB1 agonists (Deng et al., 2014). Similarly, physical dependence can be demonstrated following repeated administration of low doses of a CB1 agonist (Deng et al., 2014). In comparison with CB1-mediated analgesia, tolerance to CB2-mediated analgesia in neuropathic pain models does not appear to develop, at least over the course of ∼7 days of treatment (Deng et al., 2014). This lack of tolerance to the analgesic effects of a CB2 agonist raises the question of whether the immune modulation by CB2 agonists will also be persistent, and if so, whether this will be detrimental. Importantly, abrupt antagonism of CB2 receptors after chronic dosing with an effective dose of a CB2 agonist does not appear to elicit signs of physical or autonomic withdrawal (Deng et al., 2014). Finally, although CB2 agonists do not appear to be rewarding by themselves (Ignatowska-Jankowska et al., 2013), rats will only self-administer CB2 agonists and will only show preference for the environment in which they received a CB2 agonist if they are experiencing a painful stimulus (e.g., neuropathy) (Gutierrez et al., 2011). Conventional drug development relies heavily on preclinical models to evaluate efficacy of compounds toward potential targets. The high failure rate of agents in clinical trials has prompted a re-evaluation of the predictive reliability of this approach (Paul et al., 2010; Baxter et al., 2013). There are many potential reasons why an agent that appears effective in preclinical models fails in the clinic. These include 1) irreproducible preclinical studies, 2) irrelevance of the preclinical model being evaluated to the clinical condition being treated, 3) an inability in humans to reach tissue concentrations that were necessary for efficacy in animal models because of dose-limiting side effects, 4) species differences in how a ligand engages and activates its targets, 5) off-target negative effects that were not detectable in animal toxicology tests, and 6) lack of selectivity of the ligands used to validate the target in preclinical models. Which of these might explain why CB2 agonists have failed in the preclinical-to-clinical transition? As numerous groups have demonstrated efficacy of CB2 agonists in diverse preclinical models of pain, and CB2 agonists as used in clinical trials appear to have minimal side effects, reasons 1, 3, and 5 are unlikely to explain the failure of CB2 agonists in clinical trials, so we will focus on possibilities 2, 4, and 6. In the case of possibility 6, many CB2-“selective” agonists still have significant affinity for CB1. Because CB1 receptors are highly abundant, low occupancy still results in the activation of a significant number of CB1 receptors, potentially producing CB1-mediated effects, including significant analgesia. Analgesia produced by these agonists’ activating CB1 receptors will be absent in mice lacking functional CB2 receptors (but see above for the caveats in using existing CB2 knockout lines). The outcome of clinical trials in pain is strongly affected by the type of pain being treated, study design, patient population, and many related factors (Gewandter et al., 2014). Whereas preclinical studies are typically conducted in a genetically and environmentally (usually unenriched) uniform population of often young (and male) rodents, human populations enrolled in clinical pain trials tend to be older and of both sexes and are invariably more heterogeneous. In addition, practical concerns on adequate subject enrollment and the ease of evaluating subject response often result in clinical pain trials being performed on populations whose disease may be quite distinct from those represented in the preclinical models. For example, third molar extraction and osteoarthritis patients are often examined in early-phase analgesic trials, and commonly used preclinical pain models do not faithfully recapitulate these conditions. Indeed, this appears to be the case in that reported trials in which CB2 agonists have failed include third molar extraction (GW842166X [2-(2,4-dichloroanilino)-N-(tetrahydropyran-4-ylmethyl)-4-(trifluoromethyl)pyrimidine-5-carboxamide]; GlaxoSmithKline, Brentford, Middlesex, UK) (Ostenfeld et al., 2011), topical capsaicin-induced pain (PRS-211,375 [cannabinor]; Pharmos, Iselin, NJ) (Roche and Finn, 2010), and osteoarthritis (LY2828360; Eli Lilly, Indianapolis, IN) (Pereira et al., 2013). An additional complicating issue is that early-stage clinical trials are often not reported or are only reported in abstract form. The paucity of details and lack of peer review can make it very difficult to determine why a clinical trial has been considered to “fail,” as the decision not to pursue a clinical target may be a commercially driven rather than an efficacy-driven decision (Hay et al., 2014). Species differences in receptors and signaling pathways are additional potential confounds in moving from exploratory and preclinical studies to human therapies. Differences in sequence between receptors from different species can lead to different pharmacologies. Thus, a ligand for a rodent receptor may be inactive or have different signaling properties than the human receptor. An example of this is the H3 histamine receptor, for which ligands switch from agonism to antagonism depending on the species of receptor (Ireland-Denny et al., 2001; Yao et al., 2003). Thus, whereas in vitro pharmacology can be done in cell lines expressing receptors of the correct species (or possibly in induced pluripotent stem cells), preclinical testing is often done in rodents. Although mice expressing the human version of the appropriate receptor can be generated and used for testing (e.g., Jun et al., 2014), this is often not done. Furthermore, even if a “humanized” mouse is used, coupling between the receptor and downstream signaling pathways may be species-dependent. This concern is especially significant in situations in which there are substantial species differences in non–ligand-binding portions of a receptor, for example, in domains that may be important for signal transduction or receptor regulation, such is the case for the highly divergent carboxy termini of the CB2 receptor (Brown et al., 2002). The development and characterization of a mouse expressing humanized CB2 receptors will be very useful to address these and related questions. The development of the CB2 receptor as a therapeutic target has gained significant momentum over the past decade due to the identification of CB2-specific synthetic and natural product ligands, a better understanding of the range of physiologic processes mediated by CB2 receptors, the regulation of CB2 receptors, and promising preclinical studies. However, the publicly available clinical data have thus far been disheartening. One reason for this may be discrepancies in pain mechanisms between the preclinical models, in which CB2 agents show efficacy, and the patients enrolled in clinical trials. Thus, efforts to examine the clinical efficacy of CB2 agonists in (neuro)inflammatory conditions and neuropathic pain syndromes (e.g., chemotherapy or diabetic) may be more productive. A second potential reason for the lack of translation is that CB2 agonists show very strong functional selectivity, and this functional selectivity may significantly affect agonist efficacy across species and types of pain. With the availability of increasingly precise and selective pharmacological, genetic, preclinical, and clinical tools and a more complete understanding of the importance of CB2 agonist functional selectivity, CB2 receptors still appear to be promising targets for drug development, both for chronic pain and other indications. Wrote or contributed to the writing of the manuscript: Dhopeshwarkar, Mackie. This work was supported by the National Institutes of Health National Institute on Drug Abuse [Grants R01-DA011322, K05-DA021696, and R21-DA035068]. (2012a) CB2 cannabinoid receptors inhibit synaptic transmission when expressed in cultured autaptic neurons. Neuropharmacology 63:514–523. (2012b) Functional selectivity in CB(2) cannabinoid receptor signaling and regulation: implications for the therapeutic potential of CB(2) ligands. Mol Pharmacol 81:250–263. (2011) Protective role of cannabinoid receptor type 2 in a mouse model of diabetic nephropathy. Diabetes 60:2386–2396. (2007) Cannabinoid-2 receptor mediates protection against hepatic ischemia/reperfusion injury. FASEB J 21:1788–1800. (2013) An end to the myth: there is no drug development pipeline. Sci Transl Med 5:171cm1 DOI: 10.1126/scitranslmed.3003505. (2009) Cannabinoid type 2 receptor as a target for chronic - pain. Mini Rev Med Chem 9:11–25. (2007) Species-specific in vitro pharmacological effects of the cannabinoid receptor 2 (CB2) selective ligand AM1241 and its resolved enantiomers. Br J Pharmacol 151:1061–1070. (2013) The pharmacologic and clinical effects of medical cannabis. Pharmacotherapy 33:195–209. (1996) Signaling pathway associated with stimulation of CB2 peripheral cannabinoid receptor. Involvement of both mitogen-activated protein kinase and induction of Krox-24 expression. Eur J Biochem 237:704–711. (2000) Immunomodulation by cannabinoids is absent in mice deficient for the cannabinoid CB(2) receptor. Eur J Pharmacol 396:141–149. (2012) Cannabinoid receptors CB1 and CB2 form functional heteromers in brain. J Biol Chem 287:20851–20865. (2014) Functionalization of β-caryophyllene generates novel polypharmacology in the endocannabinoid system. ACS Chem Biol 9:1499–1507. (2014) Chronic cannabinoid receptor 2 activation reverses paclitaxel neuropathy without tolerance or cannabinoid receptor 1-dependent withdrawal. Biol Psychiatry [published ahead of print] DOI: 10.1016/j.biopsych.2014.04.009. (2008) Direct suppression of autoreactive lymphocytes in the central nervous system via the CB2 receptor. Br J Pharmacol 153:271–276. (2005) Stimulation of cannabinoid receptor 2 (CB2) suppresses microglial activation. J Neuroinflammation 2:29. (2005) The phylogenetic distribution and evolutionary origins of endocannabinoid signalling. Handb Exp Pharmacol 168:283–297. (1996) G-protein-coupled receptor regulation: role of G-protein-coupled receptor kinases and arrestins. Can J Physiol Pharmacol 74:1095–1110. (2003) Palmitoylethanolamide increases after focal cerebral ischemia and potentiates microglial cell motility. J Neurosci 23:7767–7775. (2002) Autocrine and paracrine regulation of lymphocyte CB2 receptor expression by TGF-beta. Biochem Biophys Res Commun 290:91–96. (2008) Beta-caryophyllene is a dietary cannabinoid. Proc Natl Acad Sci USA 105:9099–9104. , et al. (2014) Research designs for proof-of-concept chronic pain clinical trials: IMMPACT recommendations. Pain [published ahead of print] DOI: 10.1016/j.pain.2014.05.025. (2012) The therapeutic potential of cannabis and cannabinoids. Dtsch Arztebl Int 109:495–501. (2011) Self-medication of a cannabinoid CB2 agonist in an animal model of neuropathic pain. Pain 152:1976–1987. (2003) Cannabinoids: potential anticancer agents. Nat Rev Cancer 3:745–755. (2014) Latest progress in the identification of novel synthetic ligands for the cannabinoid CB2 receptor. Mini Rev Med Chem 14:426–443. (2013) Therapeutic utility of cannabinoid receptor type 2 (CB(2)) selective agonists. J Med Chem 56:8224–8256. (2014) Clinical development success rates for investigational drugs. Nat Biotechnol 32:40–51. (2006) The CB2 cannabinoid receptor signals apoptosis via ceramide-dependent activation of the mitochondrial intrinsic pathway. Exp Cell Res 312:2121–2131. (2005) p38 MAPK is involved in CB2 receptor-induced apoptosis of human leukaemia cells. FEBS Lett 579:5084–5088. (1998) Inhibition of the cyclic AMP signaling cascade and nuclear factor binding to CRE and kappaB elements by cannabinol, a minimally CNS-active cannabinoid. Biochem Pharmacol 55:1013–1023. (1999) Coupling of the expressed cannabinoid CB1 and CB2 receptors to phospholipase C and G protein-coupled inwardly rectifying K+ channels. Receptors Channels 6:363–374. (2011) Central and peripheral sites of action for CB2 receptor mediated analgesic activity in chronic inflammatory and neuropathic pain models in rats. Br J Pharmacol 162:428–440. (2013) The cannabinoid CB2 receptor is necessary for nicotine-conditioned place preference, but not other behavioral effects of nicotine in mice. Psychopharmacology (Berl) 229:591–601. (2001) Species-related pharmacological heterogeneity of histamine H(3) receptors. Eur J Pharmacol 433:141–150. (2008) Emerging role of cannabinoids in gastrointestinal and liver diseases: basic and clinical aspects. Gut 57:1140–1155. (2014) A novel humanized GLP-1 receptor model enables both affinity purification and Cre-LoxP deletion of the receptor. PLoS One 9:e93746. (1993) Evidence for a cannabinoid receptor in immunomodulation by cannabinoid compounds. Adv Exp Med Biol 335:115–120. (1994) Suppression of the humoral immune response by cannabinoids is partially mediated through inhibition of adenylate cyclase by a pertussis toxin-sensitive G-protein coupled mechanism. Biochem Pharmacol 48:1899–1908. (2014) CB2 receptor as a potential target in age-related diseases. J Biochem Pharmacol Res 2:33–43. (2006) AM1241, a cannabinoid CB2 receptor selective compound, delays disease progression in a mouse model of amyotrophic lateral sclerosis. Eur J Pharmacol 542:100–105. (2012) Recent advances in the development of selective CB(2) agonists as promising anti-inflammatory agents. Curr Med Chem 19:3457–3474. (2009) Species differences in cannabinoid receptor 2 (CNR2 gene): identification of novel human and rodent CB2 isoforms, differential tissue expression and regulation by cannabinoid receptor ligands. Genes Brain Behav 8:519–530. (1998) Signaling from G-protein-coupled receptors to mitogen-activated protein (MAP)-kinase cascades. Biochem Pharmacol 56:269–277. (2008) CB2 receptors as new therapeutic targets for liver diseases. Br J Pharmacol 153:286–289. (2008) Cannabinoid receptors in acute and chronic complications of atherosclerosis. Br J Pharmacol 153:290–298. (2007) Cannabinoid receptors as new targets of antifibrosing strategies during chronic liver diseases. Expert Opin Ther Targets 11:403–409. (2003) Cannabinoids and opioids share cAMP pathway in rat splenocytes. J Neuroimmunol 145:46–54. (1999) Cannabinoid receptors can activate and inhibit G protein-coupled inwardly rectifying potassium channels in a xenopus oocyte expression system. J Pharmacol Exp Ther 291:618–626. (2009) Characterizing cannabinoid CB2 receptor ligands using DiscoveRx PathHunter beta-arrestin assay. J Biomol Screen 14:49–58. (2012) Cannabinoid CB(2) receptors modulate ERK-1/2 kinase signalling and NO release in microglial cells stimulated with bacterial lipopolysaccharide. Br J Pharmacol 165:1773–1788. (2001) Expanding roles for beta-arrestins as scaffolds and adapters in GPCR signaling and trafficking. Curr Opin Cell Biol 13:139–145. (2013) The prevalence, maintenance, and relevance of G protein-coupled receptor oligomerization. Mol Pharmacol 84:158–169. (2012) The CB2-preferring agonist JWH015 also potently and efficaciously activates CB1 in autaptic hippocampal neurons. Pharmacol Res 66:437–442. (2013) Different classes of CB2 ligands potentially useful in the treatment of pain. Recent Patents CNS Drug Discov 8:42–69. (2006) Peripheral cannabinoid receptor, CB2, regulates bone mass. Proc Natl Acad Sci USA 103:696–701. (2011) A randomized, controlled study to investigate the analgesic efficacy of single doses of the cannabinoid receptor-2 agonist GW842166, ibuprofen or placebo in patients with acute pain following third molar tooth extraction. Clin J Pain 27:668–676. (2008) Endocannabinoids and cannabinoid receptors in ischaemia-reperfusion injury and preconditioning. Br J Pharmacol 153:252–262. (2010) How to improve R&D productivity: the pharmaceutical industry’s grand challenge. Nat Rev Drug Discov 9:203–214. (2013) A proof-of-concept (POC) study including experimental pain models (EPMs) to assess the effects of a CB2 agonist (LY2828360) in the treatment of patients with osteoarthritic (OA) knee pain. Clin Pharmacol Ther 93:S56–S57. (2007) Cannabinoids and multiple sclerosis. Mol Neurobiol 36:45–59. (2010) International Union of Basic and Clinical Pharmacology. LXXIX. Cannabinoid receptors and their ligands: beyond CB1 and CB2. Pharmacol Rev 62:588–631. (2013) Mastering tricyclic ring systems for desirable functional cannabinoid activity. Eur J Med Chem 69:881–907. (2010) Brain CB2 receptors: implications for neuropsychiatric disorders. Pharmaceuticals (Basel) 3:2517–2553. (2012) Receptor heteromerization expands the repertoire of cannabinoid signaling in rodent neurons. PLoS One 7:e29239. (2007) Receptor heterodimerization leads to a switch in signaling: beta-arrestin2-mediated ERK activation by mu-delta opioid receptor heterodimers. FASEB J 21:2455–2465. (2012) Cannabinoids: novel medicines for the treatment of Huntington’s disease. Recent Patents CNS Drug Discov 7:41–48. (2007) The CB2 cannabinoid agonist AM-1241 prolongs survival in a transgenic mouse model of amyotrophic lateral sclerosis when initiated at symptom onset. J Neurochem 101:87–98. (2013) Genetic background can result in a marked or minimal effect of gene knockout (GPR55 and CB2 receptor) in experimental autoimmune encephalomyelitis models of multiple sclerosis. PLoS One 8:e76907. (2000) Evidence that 2-arachidonoylglycerol but not N-palmitoylethanolamine or anandamide is the physiological ligand for the cannabinoid CB2 receptor. Comparison of the agonistic activities of various cannabinoid receptor ligands in HL-60 cells. J Biol Chem 275:605–612. Vazquez C, Concepcion G, Tolon RM, Dittel BN, Romero J, and Hillard CJ (2014) New mouse model for the study of CB2 cannabinoid receptors, in 24th Annual Symposium on the Cannabinoids, pp P3–24, International Cannabinoid Research Society, Research Triangle Park, NC. (2014) Biased ligands at G-protein-coupled receptors: promise and progress. Trends Pharmacol Sci 35:308–316. (2014) Adverse health effects of marijuana use. N Engl J Med 370:2219–2227. (2005) A role for cannabinoid receptors, but not endogenous opioids, in the antinociceptive activity of the CB2-selective agonist, GW405833. Eur J Pharmacol 528:65–72. (2008) Cannabinoid CB2 receptors in the gastrointestinal tract: a regulatory system in states of inflammation. Br J Pharmacol 153:263–270. (2013) Δ-Tetrahydrocannabinol induces cytotoxicity in macrophage J774-1 cells: involvement of cannabinoid receptor 2 and p38 MAPK. Toxicology 314:254–261. (2009) Endocannabinoid receptor pharmacology. Curr Top Behav Neurosci 1:37–63. (2003) Molecular modeling and pharmacological analysis of species-related histamine H(3) receptor heterogeneity. Neuropharmacology 44:773–786. (2006) In vitro pharmacological characterization of AM1241: a protean agonist at the cannabinoid CB2 receptor? Br J Pharmacol 149:145–154. (2007) Cannabinoid CB(2) receptor activation decreases cerebral infarction in a mouse focal ischemia/reperfusion model. J Cereb Blood Flow Metab 27:1387–1396. You are going to email the following CB2 Cannabinoid Receptors as a Therapeutic Target—What Does the Future Hold?